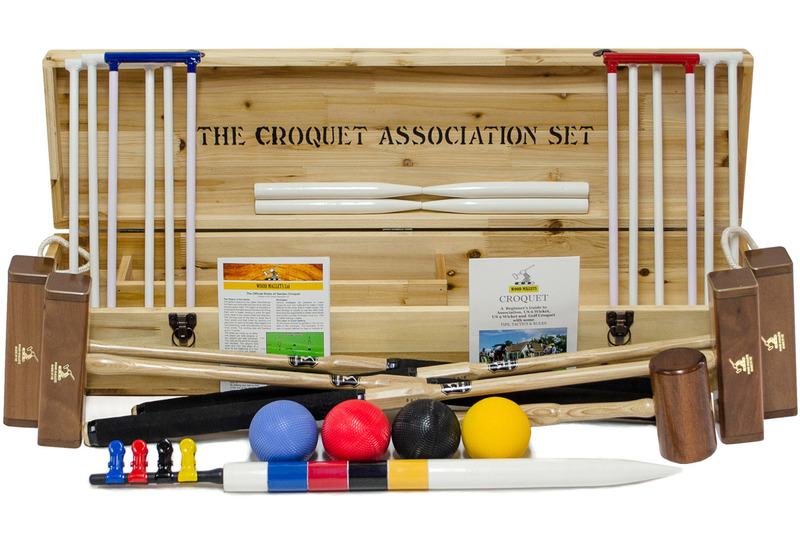 The Croquet Association 4-Player Set has been developed in collaboration with, and is endorsed by, the Croquet Association in London. It contains competition mallets made to the exact specifications of World Champion player Joe Hogan. The balls are solid reinforced composite balls, meeting regulation specifications for size & weight and of a quality ideal for club use. Steel hoops, powder coated to prevent rusting. A magnificent croquet set, and one destined to be passed down the family. We offer a number of accessories to go with this set. The secondary colour balls are worth having if more than 4 people will be playing at the same time, or when playing with 2 balls. We also offer extra Hurlingham mallets for the occasions when 4 mallets are not enough. If you wish, we can personalise your competition mallets for you, free of charge. Each mallet can have your choice of initials or names (up to 10 characters, 36pt in block capitals) stamped in gold onto the blank side of the mallet head. In addition, you may choose the grip colours of the mallets if you wish. Grip colour options (subject to availability) are: Cobalt Blue, Red, Black, Yellow, Green, White, Tan, Navy Blue, Dark Brown. If you wish to take advantage of our peronalisation service for the George Wood Croquet Association Set, please just let us know (you can contact us prior to ordering, or once you have put your order through, by telephone or by email. Full-size croquet set in a traditional solid wooden storage box. This set is supplied with George Wood COMPETITION mallets. This is probably the best value full-sized boxed set available and is ideal for family use. Includes 4 hardwood mallets with leather-bound octagonal ash handles, regulation size and weight 16oz composite balls, steel hoops, hoop mallet, corner pegs, Peg clips, hardwood winning post and rules. Packed in a high quality solid wooden box with latches and rope handles. An excellent set, designed to stay in your family for years and years. 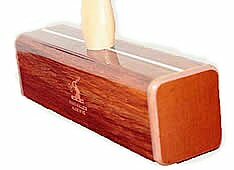 The George Wood Competition Mallet was designed by former World Champion Joe Hogan and is the UK Croquet Association's most popular mallet for serious croquet play. Mallet weights normally supplied are: 36 x 3.00lb unless other wise requested. Only selected clear American white ash is used for the handles. The lower halves of the handles are turned on a copy lathe and the top half is shaped to a positive octagonal shape, which measures 25 mm x 30 mm. The mallet heads are made from sustainably managed Malaysian Quila which is chosen for its high density, stability and attractive rich colour. The timber is semi processed and air dried before having an inlaid sighting line and ‘Tufnol’ end plates fitted. Tufnol is widely recognized as being the most satisfactory material for use on the striking area of a croquet mallet. It’s a 6mm thick brown resin-impregnated cloth material, which is bonded with hi-tech epoxy onto the ends. The end plates are virtually unbreakable and provide a crisp and true surface for striking the ball.